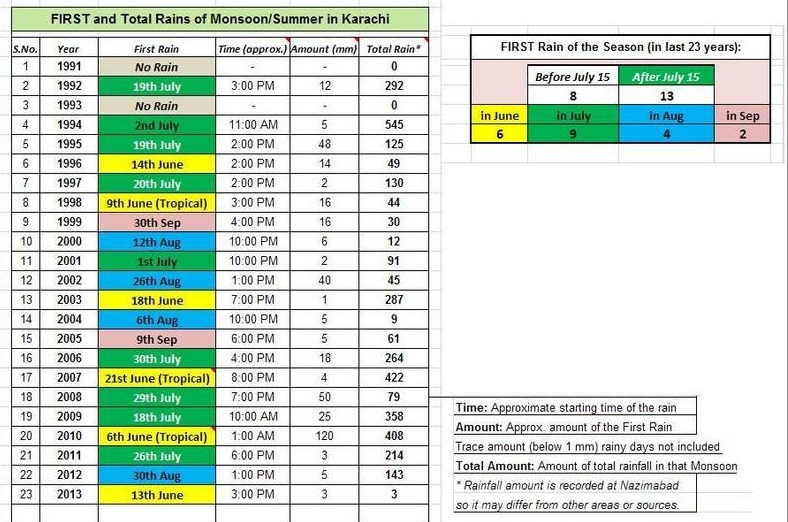 Given is a ‘quick look’ at the Karachi’s Summer Rains’ 23 years data showing the date, time and amount of First Rain and approx Total Amount of the Rains during that Season. Among those 23 years, Karachi had no Monsoon rain in two years i.e. 1991 & 1993. Rainfall amounts are mostly observed/recorded at Naizmabad No. 5, Karachi. Portal Interactive are not PWP’s article they are shared by the fans of PWP. The monsoon onset dates are not so simple to declare. Babar Hussain Bro can you please tell me that what will be weather in larkana in Eid Days? Partly/mostly cloudy. Slight possibility of rain activity in Sindh. it will be cloudy and chances of rain on Eid ( 9th August ) in Larkana ? partly/mostly cloudy with slight possibility of rain as of now.